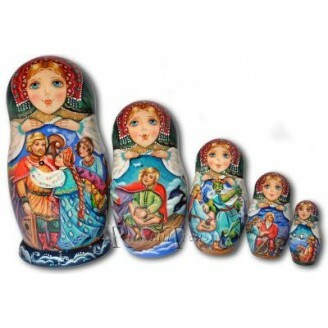 This set of Russian Matryoshka nesting dolls features one of the most famous and favorite folk stories, Sadko. The artist has skillfully wrapped each Matryoshka nesting doll with a scene from the fairytale thus achieving a smooth unfolding of the plot. This is a story about a poor musician Sadko, who turned into a wealthy merchant with the help of a secret of a magic golden fish in Lake Ilmen, which would restore youth to anyone who ate it. Sadko married a lovely girl Lubava and they lived together in a fine palace. Each Matryoshka nesting doll's face displays the image of Lubava, a true Russian beauty with her deep blue eyes and golden corn-silk hair. One day when Sadko's fleet was becalmed and couldn't move further, Sadko realized that the Sea Tsar wanted him to make an offering, and he threw himself into the sea to spare his crew from the Sea Tsar's wrath by playing for the Tsar's feast. Tsar-Morskoy liked Sadko immensely and wanted him to stay in the sea forever, but one of the Tsar's daughters, river Volkva, helped him home to his beloved wife Lubava. This set of Matryoshka nesting dolls is particularly noted for its splendid watercolors, with different shades of blue, from the azure of the sky to the vibrant cobalt of the sea waves and the fabulous cornflower blue of Lubava's eyes. The emerald green of Matryoshka nesting doll's kerchief with a fine golden ornament echoes the natural color palette of the whole composition and conjures up the images of gorgeous Russian landscapes. These Matryoshka nesting dolls are personally selected from the artists that we have worked with for many years and will be greatly appreciate by the collectors of Russian artwork as well as by those fortunate to receive this masterpiece as a gift on Birthday, St. Valentine's or any other special occasion.